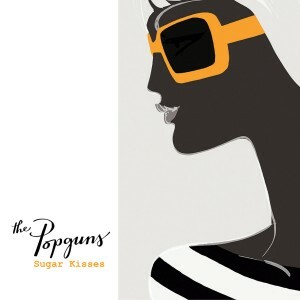 Superb new album from distinguished English band The Popguns! Their fifth studio album, ‘Sugar Kisses’ follows the celebrated 2015 release ‘Pop Fiction’ for Matinée and has a distinctly raw feel with live takes and minimal overdubs capturing the band in all their ragged glory. ‘A Beaten Up Guitar’ is a brilliant, straight down the middle power-pop blaster which delivers an outrageous bass driven rush through to a final breathless denouement of harmonized vocals. ‘Out On The Highline’ is a sultry Sunday morning slowie, while ‘A Dream Of Her Own’ boasts jangling guitars, a singalong chorus and plenty of ba-ba-ba’s. ‘The Outsider’ is a menacing slow burner that contrasts nicely with the power pop of tongue-in-cheek ‘Gene Machine’ which explores the forces of evolution at work on our biological clocks. ‘Fire Away’ is a dream for the pun-writers and a lot of fun as Wendy gets to tell some pub-bore “I’ve had a drink, but not enough tell you what I think, so Fire Away.” The album concludes with pop classic ‘Finished With The Past’ with its bristling mass of guitars and, in the last verse, surely Wendy’s most passionate vocal ever, ending the album on a thrilling high. Surely this is the perfect British guitar pop album that The Popguns promised all those years ago when they first appeared in Peel’s Festive 50 and on the 90’s indie dancefloors. Cover art is again by Jason Brooks, the award winning V&A Book Illustrator of the Year. Unmissable.